NEW YORK — "Shazam!" is one of those movies with a perfect elevator pitch. Everywhere along its path to production, the same phrase guided its makers: "'Big' meets 'Superman.'" 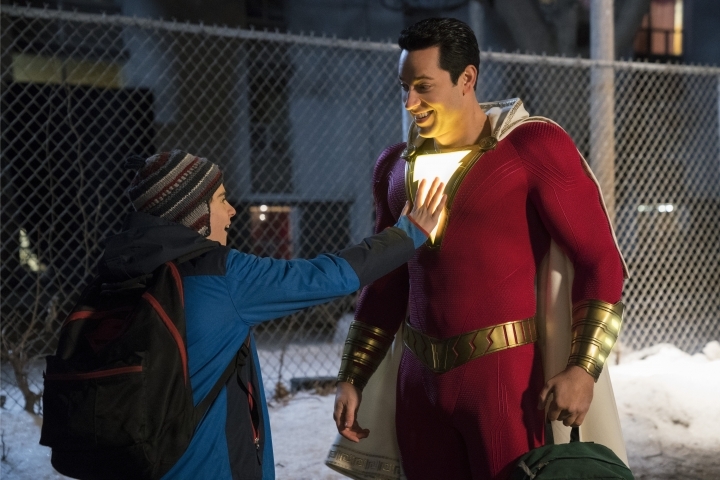 As a tale about a 14-year-old boy who finds that he can transform into a powerful adult superhero version of himself with a simple command ("Shazam! "), Penny Marshall's classic 1988 comedy was an obvious touchstone for both its body-changing plot and its sweet sense of humor. If you didn't sense the connection immediately in "Shazam!" you will by the time a giant floor piano makes a cameo. 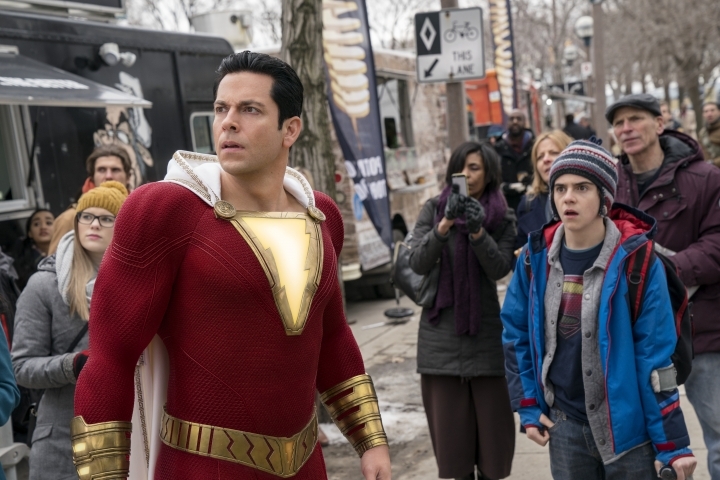 "One of the beautiful things about this movie is you can pitch it in three words," says Zachary Levi, who stars as the supersized version of Billy Batson, played by Asher Angel as a kid. 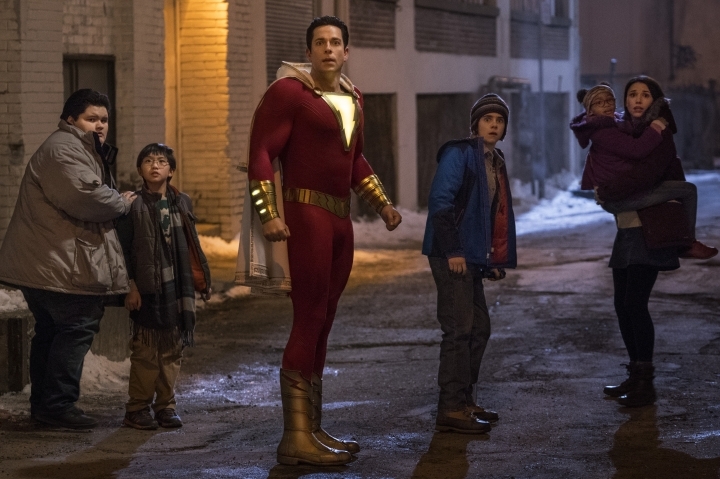 "Shazam!," which opens April 5, is the latest superhero movie to look further afield than comic book mythology for inspiration. Just as the gritty Wolverine thriller "Logan" drew from Westerns like "Shane," and "Black Panther" was built as a Bond-like spy movie, the PG-13-rated "Shazam!" has its DNA rooted in 1980s adventure-comedies, especially the Amblin Entertainment variety like "Goonies" and "Gremlins." The superhero is, increasingly, a Trojan Horse in spandex. 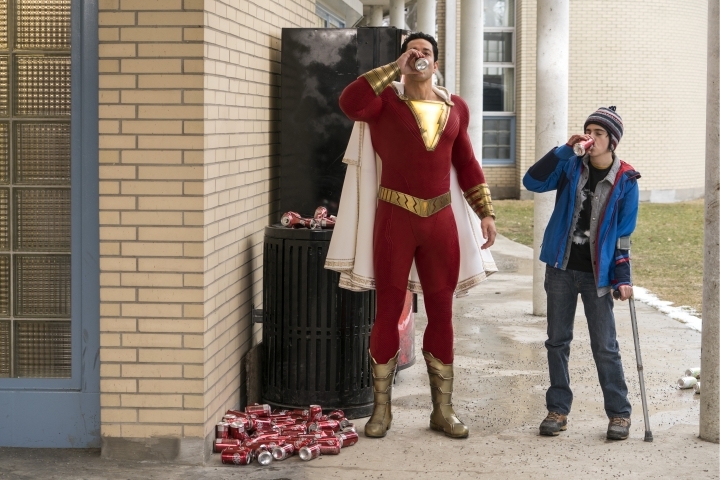 "People are understanding that you can tell a lot of different types of stories under the superhero banner," says "Shazam!" producer Peter Safran, who also produced "Aquaman" and who manages "Guardians of the Galaxy" director James Gunn. "They don't all have to be world-ending, epic spectacles. You can tell great family stories. It can be a heist movie. It can be a horror movie, which I believe something like ('Aquaman' spinoff) 'The Trench' could be." 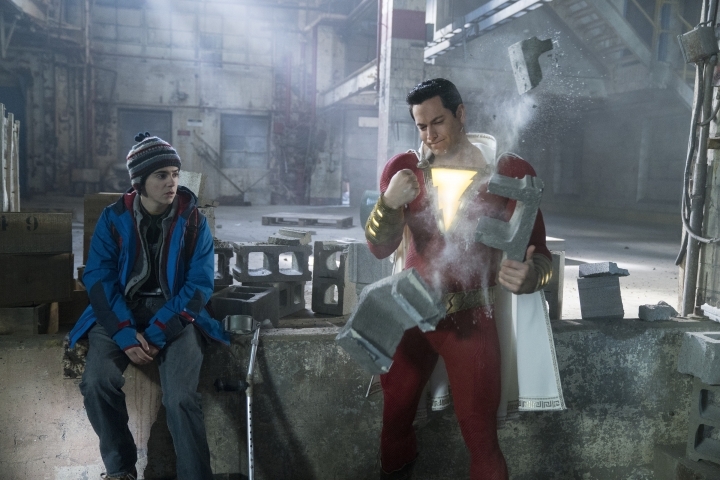 By going small, the happily quirky "Shazam!" (made for a relatively modest $100 million) is poised to be one the biggest successes in Warner Bros.' DC Comics films. This decade, the only DC release with equal acclaim ("Shazam!" is 93 percent fresh on Rotten Tomatoes) is 2017's "Wonder Woman" — and it's not like the much-derided, much bulkier, much more expensive "Justice League" or "Suicide Squad" are even close. Box-office expectations have been ratcheted up. At the kid-friendly caper's Hollywood premiere Thursday, Warner Bros. erected a Ferris wheel as a nod to both the movie's carnival climax and fun-loving spirit. For the makers of "Shazam!" the film has a kind of elemental superhero appeal based on the dream of becoming a superhero. 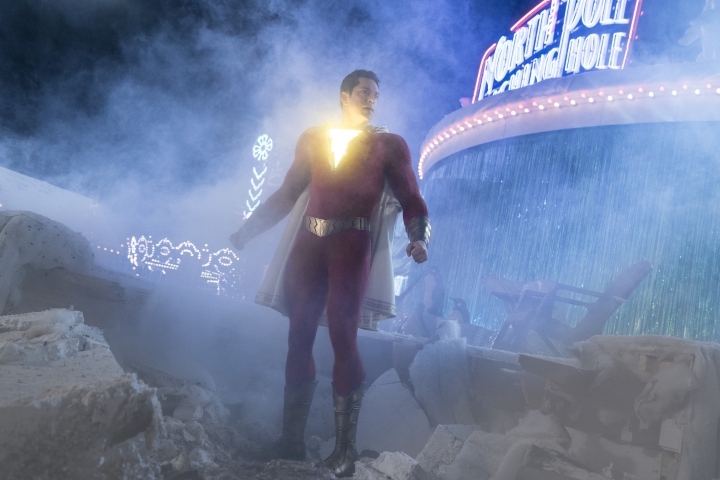 Where other comic-book movies are otherworldly, "Shazam!" and its hero are gleefully goofy. "I feel bad for a lot of other actors who end up being superheroes," says Levi, whose breakthrough series, the spy comedy "Chuck," had some of the same flavor. "Most other superheroes are cool and collected and brooding. They're saving the world. Billy Batson is one of very few who gets to be very stoked. It's not like a responsibility; it's crazy cool." The ironic thing is that "Shazam!" dates back to the early days of comics. It was created in 1939, a year after Superman, and very much conceived as a knockoff of the Man of Steel. Then, the hero was called Captain Marvel (nickname: the Big Red Cheese) and at times, he even outsold Superman in the 1940s. A 1941 black-and-white Captain Marvel serial was one of the very first comic book adaptions. But by the early '50s, a copyright infringement lawsuit from DC Comics finally caught up to Captain Marvel's publisher, Fawcett Comics, shutting the character down. A strange afterlife followed. In 1967, Marvel's own Captain Marvel — same name, different hero — debuted. By 1972, the original Captain Marvel was reintroduced as Shazam. It's a head-spinning twist of fate that all these decades later, both Captain Marvels are arriving in theaters almost simultaneously. "For them to come out basically in the same month is insane," says Safran. "We never really worried about it because it's such a different type of movie. It's such a different tone of movie." The big-screen debut of "Shazam!" took so long not just because of legal tangles but because of the film's unique tone. Soon after development at New Line first began in the 2000s, dark and brooding were in, thanks largely to "The Dark Knight." A number of writers took a crack at it in, including William Goldman ("All the President's Men"), in a string of stalled iterations. But as the possibilities for superhero films expanded, led by Marvel's "Guardians," ''Shazam!" found its way through just as DC's Superman and Batman revivals were sputtering. Initially, plans centered on a combo of Shazam and supervillain Black Adam, with Dwayne Johnson signed up as Black Adam. That character is expected to instead get his own movie. "There was no mandate to try to tie Shazam into the larger DC universe or do anything with Black Adam," says Safran. "It was just: This guy deserves the real estate to go tell a stand-alone origin story." An unlikely team assembled around Henry Gayden's screenplay. Swedish filmmaker David F. Sandberg, who helmed Warner Bros.' lucrative "Conjuring" prequel, "Annabelle: Creation," came aboard to direct. And it took a long time — Sandberg says more than 100 auditions — for them to find their Shazam. "He was an unknown to me. I had never seen 'Chuck,'" says Sandberg of Levi. "It was a long process of doing lots and lots of auditions with very different people to try to find the right person. That was our stipulation: You have to audition. We have to make sure you can play a child, which is something most adults never do. It's not like you have references in other movies." The 38-year-old Levi ("Tangled," ''The Marvelous Mrs. Maisel") initially turned down the audition, skeptical anything would come of it. "I asked my agent, 'Aren't they looking for huge jacked dudes or at very least very famous ones?'" says Levi. "I was like: This feels like I'm going to be wasting everybody's time." But Levi later sent in an audition tape from his phone for another part. That night, Sandberg and Safran called him to say he was right for Shazam. "Zach is basically a big kid," says Sandberg. "He has an excitement that kids have about everything." "I was flabbergasted," says Levi. "I've always been a bit of a Peter Pan-syndromed person. I hope in the best of ways." Within a week, he was cast, and Levi, a lifelong Tom Hanks fan, found himself realizing a fantasy he never expected to fulfill. "I always wanted to do something like 'Big' but you don't want to remake something that's never been touched," says Levi. "So when would I ever do 'Big'?" In Celeb Wired, we talk about everything in the entertainment industry from A to Z. We keep our gossip hunters updated with the daily hot news because we have exactly what you’re looking for. Copyright © 2015 - 2019 Celeb Wired. All Rights Reserved.